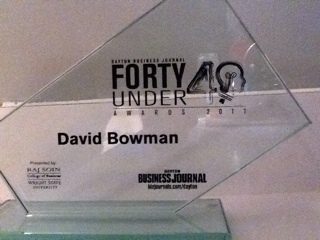 Last night, I attended the Dayton Business Journal’s Forty Under 40 Awards Ceremony at the Dayton Convention Center. I was fortunate enough to have been chosen as one of the Class of 2011 award winners. Joined by my wife, several of my colleagues, and 400 of Dayton’s most influential leaders, the night was a great one. Looking around the room last night, seeing so many people I know, respect, and admire, reminded me just how lucky I am. I’m lucky to work in Dayton – the city of my birth. It’s a big city with a small town feel. A place where people truly care about helping each other. A community that I love being a part of. I’m lucky to have a job I love. Every day at P/O/N I get to work with a great team of people and use my creativity, intellect, and drive to solve interesting new problems for our clients. I am never bored at my job, and I continue to strive to get better at what I do. It feels great to love what I do. I’m lucky to have a family that supports me day in and day out. We have challenges to overcome, goals to achieve, and dreams to bring to life, and together we are there for each other through it all. Thank you to the Dayton Business Journal for choosing me as a 40 Under Forty winner and reminding me of the overwhelming good fortune I have had in my career. I will do my best to live up to the honor. Wish me luck!